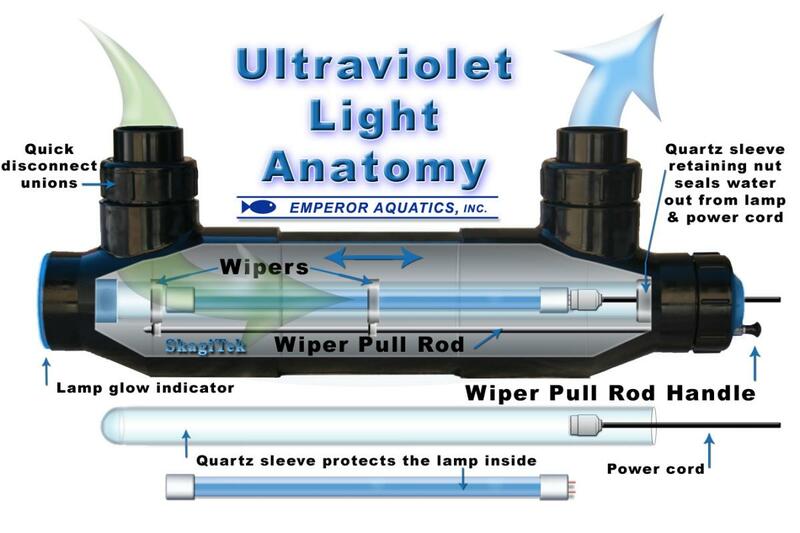 UV (Ultra Violet) Lights are a good way to get rid of algae bloom (green water) during the warm Summer months. K.O.I.’s recommendations on UV units can be found in the Construction module (how to install) and the Filtration module (how to operate) of K.O.I. UV lamps are usually isolated from the water media by a sleeve made of quartz that doesn't block UV. Those sleeves are durable, unless you accidentally break them, but the lamps are not. Vendors say that UV lamps need to be replaced every year. I was wondering how to test a UV lamp to see if we could prolong its life longer. I called a UV lamp manufacturer and found a way to verify if the lamp+sleeve assembly still emits UV, without resorting to an expensive UV test equipment. The manufacturer told me that I could use a USPS stamp (above 10 cents) at night. USPS stamps have a phosphorescent coating used for sorting mail, that will glow when exposed to short wave UV. I tried it. It works and it's fun but you have to be careful not to look at your UV lamps for more than a couple of seconds, to cover all but a small part of the lamp, and to wear glasses. UV lights are dangerous for your eyes. The quartz sleeve does block UV every time it gets dirty. That is why the better UV units have a sleeve wiper to keep them clean. The glass/quartz vacuum tube also blocks UV because of a process called vitrification. The glass absorbs other materials. For example tungsten can sputter off the filaments and be absorbed into the glass. The vitrification is the primary cause of the limited life span of a UV bulb. Ballast failure can also affect service life (due to overheating). UV lamps will emit UV light long after they are no longer useful for killing algae or phytoplankton. So, according to Ken Austin, the postage stamp test is probably not very meaningful. He said that the best indicator of UV end of life is the reappearance of algae. This can happen after one year, two years or even three years of service. If you can tolerate a little algae for a while, a new bulb (with a cleaned quartz sleeve) will knock down the algae that has reappeared fairly quickly. Then save your money and let the UV unit run until it dies again (just clean the quartz now and then).